This elegant vased arrangement is an eye-catching array. 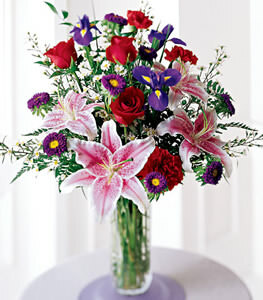 Red roses, pink Stargazer lilies, purple iris, and purple Matsumoto aster mix with red carnations and white Monte Casino in a glass vase. I just wanted to e-mail you to thank you for the lovely flowers you delivered last night...the roses and vase were stunning, very appropriate for my goddaughterýs 20th birthday. They had arrived on time and were conveniently and elegantly wrapped to easily transport home. In addition, I was relaxed that you had provided me with your 800 number in case anything went wrong at the last minute. Good job, sister loved the flowers and they got their right in the nick of time. Excellent work!